What does “big data” mean for analytics today? We couldn’t pass up the opportunity to talk “big data in the Big Easy” at our recent Tableau Conference in New Orleans. Senior product manager Vaidy Krishnan and senior sales consultant David Spezia joined me to livestream a discussion on what big data really means today, and how organizations are advancing their big data analytics strategies. Watch the recording below and read more to learn how Tableau works with your (big) data and existing technology investments in today’s data and analytics ecosystem. How has the big data landscape changed? Today, “big data” is basically just data. A range of technologies have evolved to help organizations gather, store, and process the explosion of data that digital transformation has introduced. The demand to access and analyze data has grown alongside the volume, variety, and velocity of data itself—in fact, these classic “three Vs” of big data apply more today to analytics use cases. Organizations must innovate to effectively collect, curate, and make use of their data. The cloud now provides exciting opportunities for analysis alongside robust storage and data processing services—allowing greater flexibility and scale. Additionally, major cloud providers have database engines for different query loads—analytics query loads, pipeline query loads, and storage query loads. This helps to optimize for Monday morning spikes and avoid overpaying on a Friday afternoon when fewer queries are hitting your data. How are successful organizations approaching their big data analytics strategy? Business needs change as often as the data itself, necessitating big data strategies and architectures that are agile and adaptable. Rather than building monolithic platforms, successful organizations widen their scope to consider many analytics use cases, implementing the right tools for the right jobs. This means keeping data pipelines agile, thinking intelligently about the different kinds of questions people will be asking, the levels of granularity at which you may have to store your data, how often that data is accessed, and how frequently people will be interacting with that information. Perhaps most importantly, data and analytics must be top-line priorities. If your analytics strategy is an aftermath or byproduct, you will never get buy-in to make the level of investment you need to curate, design, and continuously evolve your big data analytics platform. Organizations with mature data and analytics strategies see analytics as an absolute differentiator, and often have in-house data engineering investments. These organizations make analytics widely available and evangelize their efforts—both internally and within their industries. How does Tableau work with big data? We have a rich history of investments ahead of the curve in big data. These investments include data connectivity to both Hadoop and NoSQL platforms, as well as large-scale on-premises and cloud data warehouses—totaling to more than 75 native data connectors. Tableau fits nicely in the big data paradigm because we prioritize flexibility, enabling organizations to take advantage of any data type while empowering new users and use cases. We also believe that deploying a big data analytics solution shouldn’t dictate your infrastructure or strategy, but should help you to leverage the investments you’ve already made. As many customers are dealing with a diverse set of big data technologies, we have aligned our engineering investments, partnerships within the ecosystem, and overall vision with the evolution of the data landscape. To dive a little deeper into our big data investments and partnerships, check out our whitepaper, Tableau and big data: an overview. 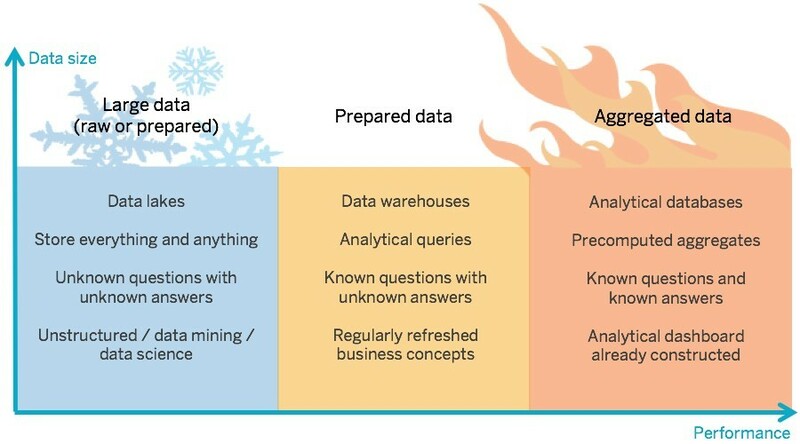 We’ve included examples of customer big data architectures to help identify common patterns. Also, watch the recording of our Tableau Conference session on advancing your big data strategy, presented by Vaidy Krishnan and strategic customer consultant Robin Cottiss.